Dear Suzie, My husband recently confessed to having an affair with a woman he works with. The worst part is that I knew something was going on between them. I could sense it. I kept asking him and he would deny it, saying they were just friends. Recently (because he was about to be busted by his boss), he admitted that they were “more than friends.” Now, he’s begging for forgiveness and swearing on his mother’s life that he will never do this again. I love my husband. And so far, he’s been a really good father and provider. I don’t want to lose my home and our marriage over this, but at the same time, I don’t want him to think he can do this to me (and our kids) and get away with it. I want to take him back, but I don’t want to look like a doormat. I want to make sure he has learned his lesson. What can I do? The bottom line is figuring out what to do when it happens. 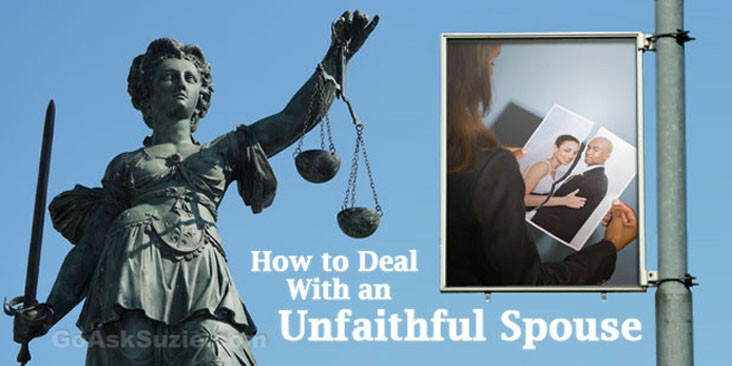 Cheating spouses is a hot-button topic for many people, mainly because it falls in that gray area (somewhere between social law and religious law). And that’s why the answers aren’t just perplexing for people like you, but for entire countries around the world. For example, in 2001, the state of Virginia prosecuted an attorney, John R. Bushey Jr., for adultery. The result? He pleaded guilty and was given a $125 fine. Now, you understand why I said it’s not considered a worthwhile legal pursuit. But while the United States, Europe, and other Western countries rarely prosecute adultery, in other countries it’s a different kettle of fish. Take South Korea for example. In late 2008, in what was probably the most famous case of criminalized adultery, Ok So-ri (one of South Korea’s most famous actresses) was given an eight-month suspended prison sentence for adultery. (Her lover was given six months.) In fact, South Korea is one of the few remaining non-Muslim countries where adultery remains a criminal offense to this day. A person found guilty of adultery in South Korea can be jailed for up to two years. But if you think South Korean courts take adultery seriously, their consequences are nothing when compared to some Muslim countries. Saudi Arabia, Nigeria, and Yemen, all have laws that make adultery punishable by stoning offenders to death. And in Afghanistan (under the Taliban rule), adulterous couples were often killed together. This tells us that if we look to the justice system for clues as to what are the appropriate consequences (or lack thereof) when dealing with philandering spouses, the answers are all over the board. In the United States (when legally pursued), you can expect anywhere from a $10 fine to a $125 fine. Outside the United States, it ranges from South Korea’s suspended prison sentence all the way to being stoned to death in Yemen. Before we go any further, let me ask you a question. Do you believe that adultery should carry legal consequences from our justice system? There are two schools of thought on the validity of the legal pursuit of adultery by the justice system — those who support it and those who don’t. The supporters of legal consequences argue two main points: (1) Adultery should be prosecuted because it tears down the fabric of home and family life. Therefore, it’s a crime against society (not just individuals) and that’s why it should be punishable by law; and (2) Giving it legal consequences will create deterrents and protect mainly women from philandering husbands. The second school of thought (those who are against legal consequences) also present two main arguments: (1) “Private and consenting acts” shouldn’t be governed by law (1965 Lawrence v. Texas); and (2) Legal pursuit will simply become a means of revenge by the spouse, allowing embittered spouses to use the courts as a vehicle for retribution instead of justice. So I’m curious to know your opinion. Where do you stand? I think it’s important to know where you stand on this issue, because it will help you understand where you want to go from here. Since there are no standard consequences for dealing with infidelity from a legal point of view, this means that how it is handled will vary from person to person and situation to situation (just like it does from country to country). So, basically, it comes down to who you are — and what you believe is right, just, and fair. 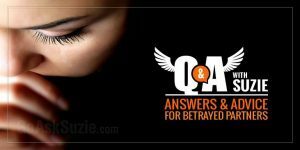 In wanting to learn how to deal with an unfaithful spouse, what you’re really asking is this: “What is my function here, and what is the appropriate response?” Both are valid questions. And asking questions means you want to learn. Since no one is ever prepared to deal with this type of situation, chances are, you aren’t sure what you believe is right, just, and fair… or what your role or function ought to be. This means you’ll have to uncover your beliefs and let them guide you in finding answers that make sense to you. To help you begin that journey of discovery, I have compiled a list of five guiding questions.